Biography & Genealogy: James Abel Harden, Class of 1864MS: Genealogy: Born- Dec. 8, 1841 in Greenville, Augusta Co. Va. Father- Daniel Madison Harden of Ky.; Mother- Eliza Ann Gibbons of Va. Mat. 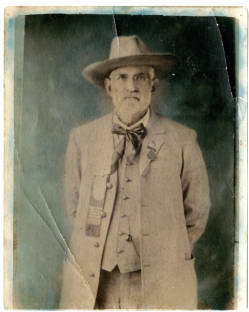 Grandfather- Abel Gibbons; Mat. Grandmother Elizabeth Bumgardener. No information on Pat. grandparents. Married- Winnie Ella Berkey of Buckingham Co. Va. Children- 1- Susan Mary (m) Hawrahan; 2- Annie Tupper (m) Moore; 3- Mildred Lee (m) Medlin; 4- David Humphreys Harden; 5- James Edwin Harden; 6- Capt. Edward Lee Harden; 7- Dixie May Harden; 8- Benjamin Harden. VMI Record: Entered VMI- June 4, 1861; Trained in Military Science and Tactics for one month before joining the C.S.A. Civil War Record- Enlisted in the 36th Va. Regiment; Appointed Sgt. Maj. Aug 10, 1861; Shown as Acting Assistant Adjutant General in the 2nd Brigade Army of the Kanawha in Nov. 1861; Resigned and discharged March 25, 1862; Became Acting Adjutant for the 23rd Va. Battalion sometime in the summer of 1862; Appointed 1st Lieut. and Adjutant of the 23rd Battalion Nov. 20, 1862; Praised for "distinguished gallantry" at Droop Mountain Nov. 1863; Captured at the Third Battle of Winchester; Held at Ft. Delaware, De. ; Released on oath June 12, 1865. Careers: Railroad Agent Died- Sept. 7, 1927 in Dillwyn, Va.